The Right to Know Workplace Notice is a job safety law poster by the Massachusetts Department Of Labor and Workforce Development. This is a mandatory posting for all employers in Massachusetts, and businesses who fail to comply may be subject to fines or sanctions. This poster must be posted in a conspicuous place where all employees will see it and must be in English as well as any other language employees have as a first language. This poster describes the right that employees have to safety in the workplace as well as training if employees have to work with toxic or hazardous substances while at work. Employees have the right to file complaints should the workplace seem unsafe. This poster lists who to contact should an employee have to file a complaint. MA All-In-One Labor Poster: Instead of printing out dozens of posters, employers can also purchase an all-in-one poster that covers both Massachusetts and Federal poster requirements by clicking here . It appears you don't have a PDF plugin for this browser. Please see the link below to download massachusetts-rtk-poster.pdf. language is other than English, the notice must be posted in that language. program must be conducted by a competent person and may be in the form of verbal and/or written instruction. during the employee’s normal work shift or work hours. The employer must maintain a record of this training. 2. The MSDS provided by the employer is incomplete or outdated. Association (NFPA) symbol if available. Labels must be clear, prominent, in English and weather re sistant. the complaint must be sent to the employer at the same time by certified mail. the Statehouse Bookstore (617- 727-2834). There are an additional six optional and mandatory Massachusetts labor law posters that may be relevant to your business. Be sure to also print all relevant state labor law posters, as well as all mandatory federal labor law posters. 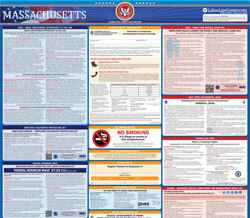 Instead of printing out pages of mandatory Massachusetts and Federal labor law posters, you can purchase a professional, laminated all-in-one labor law poster that guarantees compliance with all Massachusetts and federal posting requirements. Fully updated for 2019! While we do our best to keep our list of Massachusetts labor law posters up to date and complete, we cannot be held liable for errors or omissions. Is the poster on this page out-of-date or not working? Please let us know and we will fix it ASAP. LaborPosters.org will email you a printable PDF of this Massachusetts labor law poster, 100% FREE. You'll also get notified when new posters are available. This poster download is provided as-is, with no warranty or guarantees. Please verify with Federal and Massachusetts authorities to confirm that you are posting all of the correct (and updated) posters required for your type of business. Instead of printing out pages of mandatory Massachusetts and Federal labor law posters, you can purchase a professional, laminated all-in-one labor poster.